Twitter is one of key tools in my platform toolbox. It represents about 21 percent of my blog referral traffic. In terms of the return, I don’t know of a better investment. I am adding 73 new followers per day. I am re-tweeted 260 times per day. My total daily reach is 418,908. Yet, I spend less than thirty minutes a day on Twitter. I don’t know where else I could impact that many people with so little effort. Post links to my current blog post. At 6:00 a.m. 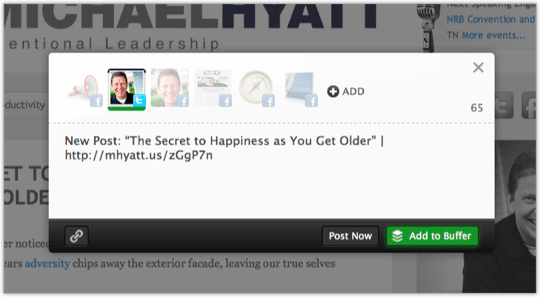 I tweet a link to my newest blog post, using Buffer’s “Post Now” function. 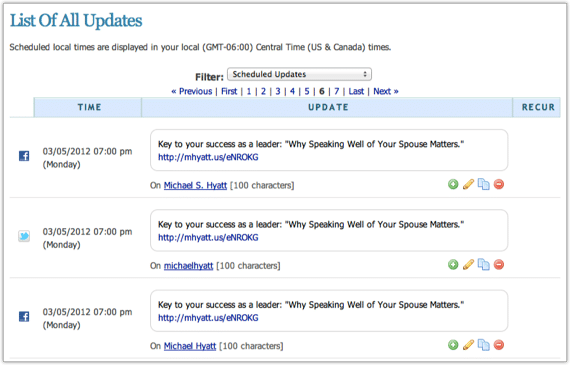 At the same time, I schedule another promotional tweet for 11:20 a.m. using HootSuite. These two actions take less than a minute. Review and reply to overnight activity. 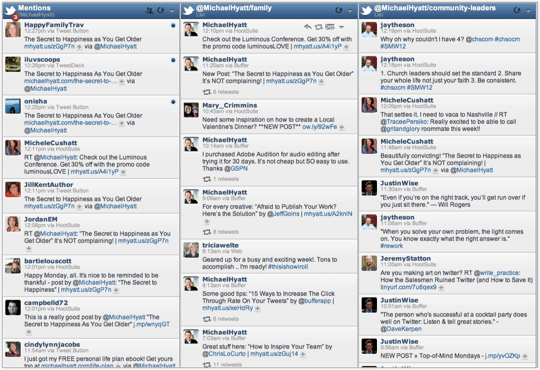 As soon as I am done with the previous tasks, I scan my “streams” (i.e., columns) in HootSuite for messages, mentions, and interesting tweets that might have been posted overnight. I then reply or retweet as appropriate. This usually takes me five minutes, max. 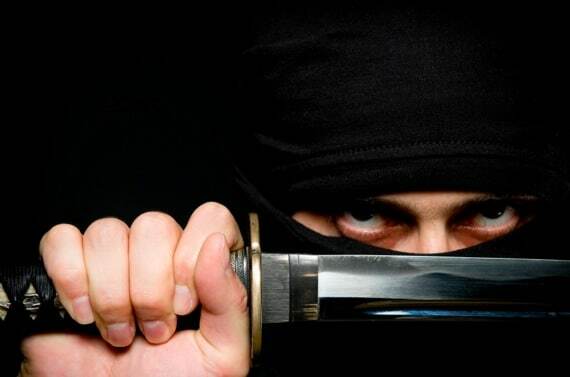 Create tweets with links to interesting news and blog posts. Once I have completed the previous task, I begin reading the days news and blog posts. I refer to this as “content foraging.” I am looking for articles to share with my followers. I scan more than two hundred news and blog feeds a day, using Google Reader. Note: I do not read two hundred feeds. I only scan, looking for headlines that catch my interest. If they do, I read the article or post. If I think my followers will benefit from the content, I click the Buffer icon in Chrome (my browser). 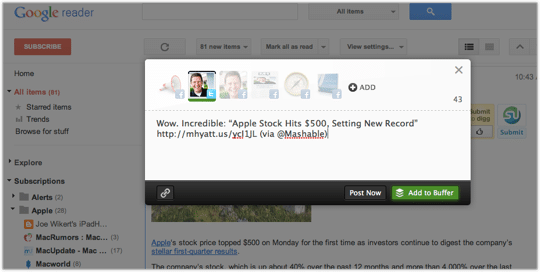 It automatically grabs the post title and creates a link to it using my custom URL shortener. I usually add a comment and then add it to my Buffer. My goal is to find 10–12 articles I can share. 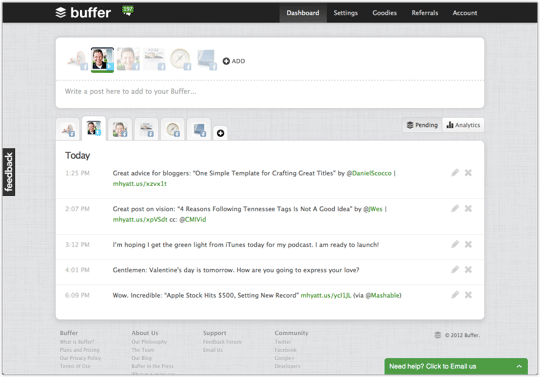 Buffer is the foundation of my Twitter strategy. It assigns each tweet to the next available slot in my pre-determined Tweeting Schedule. I only spend about thirty minutes reading like this. Creating the tweets probably takes ten minutes of this time, as I am doing it in real time as I come across a post I think my followers will enjoy. 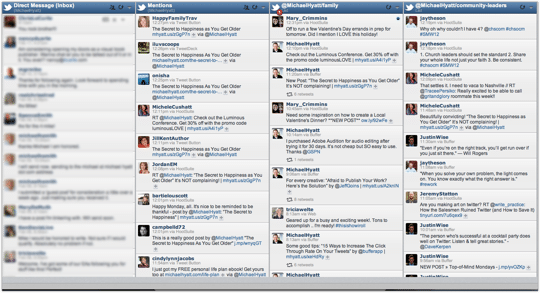 HootSuite makes it easy to segment my attention. I have my streams arranged in HootSuite from left to right, with the streams I want to spend the most time on in the left-most column. In other words, I look at my direct messages first, then my mentions and replies, then my family, my community leaders, friends, sources, etc. This probably takes me another 15 minutes, depending on what else I have going on that day. This may seem like a lot of activity. But again, using the right tools, I can do all this in about thirty minutes a day. I think the impact is well-worth the investment. Questions: What is your Twitter strategy? What tools do you use? You can leave a comment by clicking here.